>> What is Tibet Permit? Non-Chinese passport holders (including those visitors of Taiwan, Hong Kong, Macau and other countries) should get a Travel Permit for entering Tibet in advance. Otherwise, they would be refused by the inspections on their way to Tibet. Furthermore, only then can you obtain the permit required to buy an air ticket in to Tibet. >>How to Get your Travel Permit? Contact us to book a Tibet tour package, we will help you to get the Tibet permit before your journey. (g) Visa No. & copy of Visa. (1) Firstly you should know that you can get the Tibet permit after entering China, not before coming to China. (2) Please be sure all information exactly the same as on your passport. (3) All kinds of people can get Tibet permit through a travel agency except diplomats, journalists and government officials who should travel to Tibet under the arrangement by the Foreign Affairs Office of Tibet Government. (4) Service charge by the government to get the Tibet permit is 8 US dollars per person. This is included in the tour package we quoted to you. (5) You need to apply for the travel permit at least 10 days prior to your entry date. Please provide all the necessary documents to us at your earliest time. Because it is also requested to show Tibet travel permit while booking flight tickets or train tickets. (6) We don't provide "permit-only" service. We only help the clients who book Tibet tour from Discover China Tours. (7) Multi-entry travel Permits are not available. (a) If you hold a L visa (tourist visa), "documents for applycation" as above are all you need to prepare. (b) If you hold a D visa (settlement visa) or a Z visa (vocational visa), except "documents for applycation" above, you should offer us a certificate of employment or proof of residency. (c) If you hold a F visa (visitor's visa), except "documents for applycation" above, you should offer us the certificate of invitation company/organization. (d) If you hold a X visa (study visa),except "documents for applycation" above, you should offer us the certificate of your Chinese school/college. 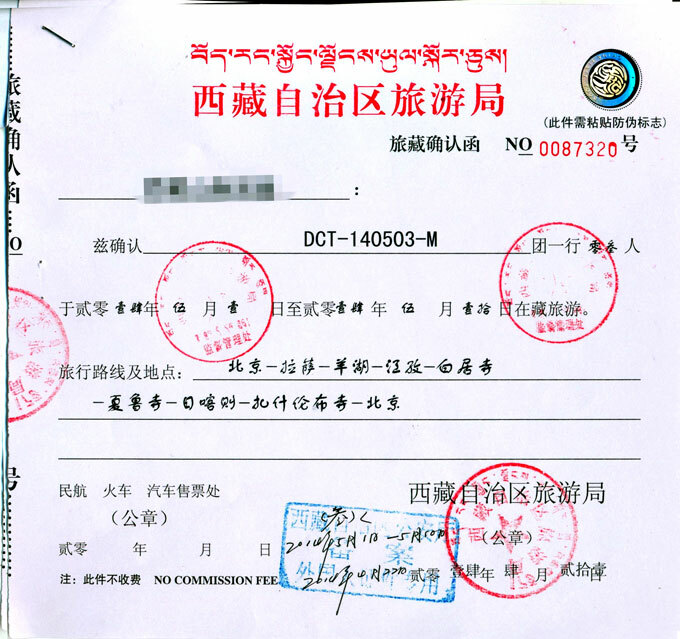 >>When should you apply Tibet Permit? After you get your China visa***, you could apply a Tibet Permit. The Tourist Administration need about 2-4 working days to issue a Tibet Permit. But sometimes, they need 7-10 working days. So, our suggestion is, after you got your China visa, offer us your documents ASAP, and we could apply the permit under the condition. *** If you booked a package with Tibet schedule,please do tell your tour consultant before your apply China visa, he/she will guide you how to apply the visa. Please do not do the China visa application without previuse notice to your consultant in case of refusal. >>Where To Enter Tibet, And How To Enter Tibet? We have 3 ways to enter tibet: by air, by train and by tour vehicle from designated line. The airport and train station will check your Tibet Permit before you check-in, so we will mail the Tibet Permit to you when you arrive China. And If you choose a vehicle tour into Tibet, our tour guide will take your Tibet Permit to pick you up. >>Can Non Chinese Nationality Traveler Take Long-Distance Bus To Enter Tibet? Please do not forget every Non Chinese need to get a Tibet Permit before he/she visit Tibet. And now back to the question. Non Chinese could take some of long-distance buses to enter Tibet, these bus do not drive through Qamdo Prefecture (include: Jomda, Gonjo, Riwoqe, Dengqen, Chagyab, Baxoi, Zogang, Markam, Lhorong, Banbar Counties) , Mainling County (Nyingchi), Bowo County (Nyingchi), Yadong County (Shigatse) and Gyirong County (Shigatse). For example, Non Chinese could not take long-distance bus from Chengdu/Shangri-La to Lhasa because the bus drive through Changdu Area. And Non Chinese could take bus from Xining to Lhasa because the bus do not drive through any areas not open to Non Chinese. >>Which Area Do Not Open To Non Chinese Nationality traveler? 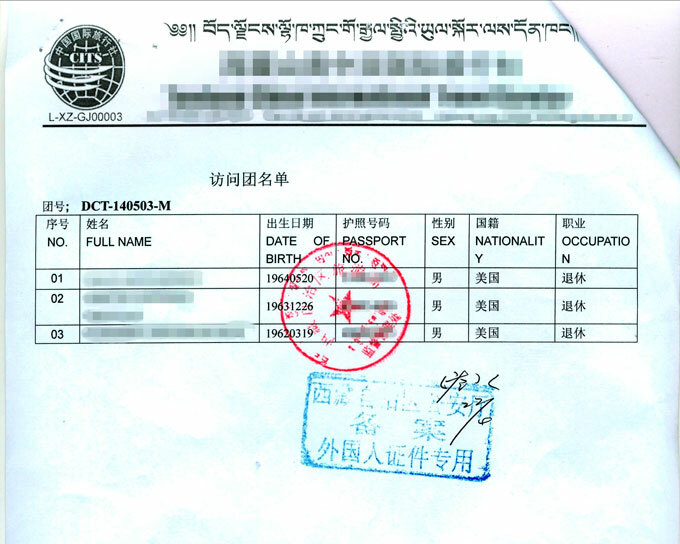 (a) You will get your Tibet Permit after you are in China, not before you depart your country/area. (b) Travelers from Hong Kong, Macao, Taiwan area need to apply Tibet Permit when entery Tibet and follow all regulations above. (c) There are two types of travel permit:The entry permit (TTB permit) and The Alien's travel permit (PSB permit). All we intruduce you above is for TTB permit. If you could like to travel some unconventional area of Tibet and need to have a PSB permit, please contact us, we will help you on your request. (d) We do not offer "permit-only" service because the offical need us to arrange a qualified tour guide to guide the visitor in all their program in Tibet. So we could only arrange permit for clients who book Tibet packages with us. (e) Multi-entry travel permits are not available. (f) from Kathmandu via Kodari to Zhangmu Port to enter Tibet of China do not need Tibet Permit, but need a group visa. If you need to travel from this way, please scan your passport to us, we will send a invitation to our Nepal local agent; and after you arrive Kathmandu, the Nepal local agent will collect your passport to apply group visa. Chinese Embassy in Kathmandu issue this type of visa only on Monday, Wednesday and Friday. Journalist, diplomat and government officials could not visit Tibet on this way. (g) Do not talk about political topic of Tibet to your tour guide or other persons in Tibet. And please respect local resident's religion and life style.